New pedal promises legendary Klon-like tones. New pedal combines the tones and gain of the Red Llama pedal with a frequency doubler that creates an octave-up effect. 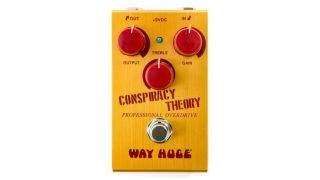 Way Huge's latest pedal was designed in conjunction with Joe Bonamassa. When it comes to rich, creamy analog delay tone, the Way Huge Aqua-Puss is pretty hard to beat. But as good as it sounds, it lacks a few features, including long delay times.